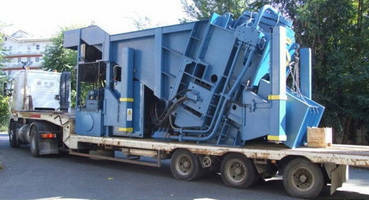 Mobile Press Shears handle high-production scrap processing. Designed for productivity and durability, VS Series pre-compression shear is offered as mobile system in 600-700 ton range that utilizes inclined-plane gravity feed system. Single operator can load feed box, which is inclined to 30Â° angle, and operate shear via remote control system from cab of any standard loader. Operator never has to stop loading to process batch, because material automatically advances into side compression chamber. Vezzani has introduced a new transportable shear based on the principles of engineering strength and service support proven by Vezzani's PC/AC pre-compression shear. Ovada, Italy - Mobile scrap processing operations can look forward to productivity and durability equal to the standards of today's most advanced stationary plants, as Vezzani S.p.A. introduces the new VS Series of transportable shears. The new VS model pre-compression shear is offered as a mobile system in the 600 to 700 ton range that utilizes the same highly efficient gravity feed system that Vezzani patented for its acclaimed PC/AC stationary shears. According to Gabriele Merlo, Business Development Director at Vezzani, the company's goal in developing the VS Series was to engineer a light, compact and transportable unit that could be manufactured and supported to the same high quality standard as Vezzani's stationary machines. "Our customers want us to cut scrap, not corners," Merlo stated. "The VS press shear is built to out produce existing mobile shears for many, many years. And we designed it to ensure that, when you take your shear on the road, you don't have to leave your service support behind." While Vezzani has established a global reputation for its large production shears, Merlo says the VS Series incorporates features developed with smaller operations in mind. "The VS Series fills our product portfolio with a product that can help small companies to grow their business. It gives owner-operators and small crews a flexible piece of machinery that can travel anywhere and go right to work without installing a foundation or pit or electrical lines." Operators of any size will also welcome VS Series for projects jobs facing logistic challenges. High mobility and easy setups provide an option to process the material directly onsite and ship the finish product to its final destination right away. Field trials on customer jobsites have shown the VS transportable shear is meeting Vezzani's design goal of achieving greater than 20 tons/hour of dense, high grade material. Customers have been especially pleased with the unit's ability to load oversize material, and to minimize the time required for pre-cutting. This is achieved as a result of the adaptation of the Vezzani patented inclined-plane gravity feed system. The powerful side compression and cutting operations cycle continuously so no time or energy is wasted on the jobsite. The simplicity of the feed system also saves costs. A single operator can load the feed box and operate the shear through a remote control system from the cab of any standard loader. All types of material, including bulky and long-dimensioned scrap, can be loaded in to the large open target of the feed box, which is inclined to a 30o angle. The operator never has to stop loading to process a batch, as the material automatically advances into the side compression chamber. A new evacuation system developed by Vezzani also gives the operator more flexibility for transloading finished material to trucks. Simplicity is a key factor for Vezzani's engineered approach to reliability and service support. "Our support concept begins with minimizing the number of moving parts in the machine. Now there is less to go wrong. Using the highest grade steels, we bolt on our wear plates, even though it costs less to weld. We do it this way because it lets clients replace just a small part instead of the entire plate. This means less maintenance costs and it also makes the plates easier to uninstall"
Merlo says that Vezzani's factory support team actually travels along with the VS shear, thanks to the remote "teleservice" communications system built into every unit. "To ensure maximum utilization of each piece of equipment, we include advanced training for operators and technicians with the purchase of the machine," Merlo continues, "so our customers are well prepared to handle most of their own troubleshooting right on the job. But if they do run into a problem, our factory team can dial in and run diagnostics wherever the shear is working. In most cases, that's enough to resolve the issue. If not, we'll have a technician onsite within 48 hours - and he'll arrive with all the necessary information on the nature of the problem, regardless of where the machine is located." Vezzani was able to adapt the PC/AC shear into the mobile VS shear with relatively few changes in the overall design concept. The single compaction ram of the PC/AC was replaced by two rams, one on each side. This was done to balance its weight in transit. Retractable legs were added so the machine can self-load on and off a low-boy trailer. This feature allows for fast set-ups and take-downs as the system is moved between jobsites. Setup is especially quick as the VS Shears require no foundation or pit; their evacuation system allows the material to slide horizontally. The VS shears are sized for "street legal" transport without waivers on most roads. Finally, the machine's diesel tank was right-sized to allow a full shift of continuous operation without refueling. Like Vezzani's PC/AC, the VS shear uses a combination of strategies to reduce energy costs and increase profitability. The gravity feed eliminates the cost of conveying material into the compression and shearing zone. The side-compression is concentrated on a very small area, compared to a traditional shear. This results in a much higher specific pressure on the material, up to 10 times the specific pressure obtained in a traditional shear box. The final product is much denser than material produced by traditional shears, which leads to lower costs for shipping it to the final customer and a higher value when the material is sold. Vezzani is currently offering its new mobile system in two models based on nominal cylinder forces: the VS 600 and VS 700. Either way, the VS mobile press shears offer a significant step up for scrap processors looking for ways to earn more on the road.